Establishing and running a successful business takes a lot of time, efforts, and participation. In many organizations, the costs and expenses are mainly allotted are in recruitment and HR. For every organization, it becomes very difficult to bypass such circumstances. With the ample evolution of time and technology, Human Resource Software that boosts and advances HR related processes has become available in today's market. This assist organization to save lots of money and efforts which can be easily used in other aspects of the business to achieve the pre-determined goals. As the famous aphorism goes, â€˜Time is Moneyâ€™; so, time saved by HR technology is directly proportional and comparative to money saved. But this query may arise to save time using this Human Resource software, an organization would require a lot of funds initially as well. Which drives companies to think that Human Resource software technology is only for the substantially spacious and vast companies. Actually, this is an ill-advised and flawed ideology and thus needs to be corrected as soon as possible. A feature based HR technology product is flexible enough to serve particular features which company wants to evaluate and even pricing incurred also depend on features opt for. To add to this there are HR Software companies providing a Free Demo of their product. First of all, to start with there are software companies which specifically target small business. So even the features in this software are completely designed to meet the requirements of small businesses. To add to this there are companies which also provide the free trial period for their software. This allows the small firms to settle with the software and also with the change that the software provides. When technology and HR processes, the hiring process has been highly automated. 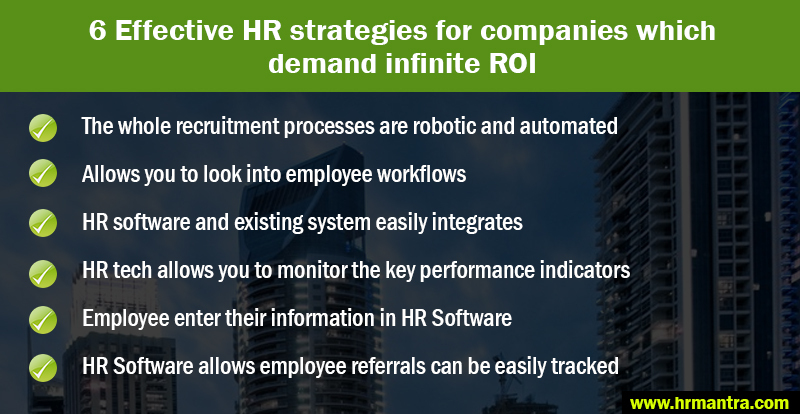 A creamy flow integrated HR solution assists in managing recruitment process and even assists to save precious time of organization. With the help of HR software, now you can effortlessly monitor and keep tracking the applications that you have received for approval, create job openings, look into the tedious process of hiring and conceivably transfer the new employees to the payroll. The HR software technology can quickly make all these tasks, and hence you can save your precious money, time and participations. In bonus, Human resource management system can assist you to tackle duplication of data and thus the time and efforts that The company can be used in various other Human Resource issues which would require more intervention. HR software technology can simply monitor the workflow of the business. It assists the organization to deal with all the important elements that are required to boost their business. HR technology allows you access the productivity and performance of the employee, review the performance of an employee within the organization, take care of various concerns of an employee in the organization and conveniently track the time and efforts that are spent on a clientâ€™s work. Many companies assume that their current HR process would be hindered and eventually be discarded if they integrate HR software technology in their organization. But, in reality, the HR software nowadays are fully configurable to company's needs. HR software is a great product that helps manage the whole lifecycle of an employee within the organization. The Company will be provided with some great solutions so that your firm can grow over a period of time in future. It is very crucial for an organization to know how their firm is performing at a given moment of time. The organization should be easy to access the data like absence analysis of the employees within organizations, training schedule of employees who are needed, various hiring activities as well as various performance indicators. Because of HR software, you would come across numerous listing and graphs that are needed by different organizations and clients from time to time. These parameters provide intense information about how the workflow is and how is its growth to achieve goals. By having all these data clients can efficiently and quickly make decisions based on these statistics. Another significant way to save time is to make the employees of your organization enter their data into the database of the company. This can be done with the help of HR software. You must make a system where employees can feed the data on their own such that HR departments are free to do some other work. Also, HR people can easily track the number of leaves that a particular employee of the organization takes in a month. Gradually, eliminating the search for data in a manual paper based system. Nowadays, employee referrals are trending and your organization can efficiently track the referral campaigns with the help of HR software. HR technology easily assists you to follow the source of reference for a particular employee. In bonus, all the data regarding candidates, referrals, status are available at one place which assists in managing it easily and more efficiently. It can also assist you to save hiring cost and help you hire right candidates at the right place.